On last week's SmackDown we will see a first time ever historic match between John Cena and Shinsuke Nakamura with the winner going on to face Jinder Mahal at SummerSlam in Brooklyn! Now that Nakamura is the No. 1 contender - what's next? Press F5 or refresh for more updates during the show. Smackdown opens with footage from after last week's Smackdown, with Baron Corbin attacking Shinsuke, and John Cena coming to make the save and AAing Corbin through the announce table. John Cena hits the ring. "Man, we have some people excited! We have some people upset! But I guarantee I'm as fired up as each and every one of y'all! Toronto, you know what I know: any night could be full of these moments, the moments that last a lifetime. You saw this stage, a dream match was set! A trip to Summerslam, a championship opportunity on the line! As Super Cena squared off with the King of Strong Style, Shinsuke Nakamura! I found out real quick that Shinsuke is afraid of nothing. And I gotta be honest with you, for a while, I didn't know why you would chant that. But then I found out that Nakamura hits hard. Real hard. Like I was in there doing my thing, you know, my typical deal. 'You can't see me.' I thought I was going to punch my ticket to Summerslam, 17 time champ, Jinder Mahal, you better watch out. Yeah, I was doing the same thing. And then all of a sudden, the ref was raising Nakamura's hand. And then it hit me, I lost. And I mean, like, no blind referee, no foul play, no Montreal Screwjob, I just lost. I know you guys know this: that doesn't really happen a lot to me. But I did the only thing I could do: I dusted myself off, and out of respect, I shook the hand of the man who earned the right to become champion. And out of respect, he shook my hand back--"
Baron Corbin comes out. "Oh John, why don't you just stop? I am so sick and tired of people talking about that stupid handshake. And whose dream match? Who cares? All I know is last week, you stuck your nose in my business. I'm Mr. Money in the Bank, and this contract means I do what I want, when I want. If there's anyone you can respect, it should be me, not Nakamura. I am the future, I have no problem making you the past." "Well I have no problem telling you you're a skinny-fat, overrated dumpster fire just like that sign says. (pan to sign that says 'Baron Corbin is a dumpster fire') I've heard a lot of things at WWE events, but this is the first time I've heard an arena chant 'dumpster fire'. Why don't you come down here and I might put you through another table?" "Why would I do that when I have this? You have nothing I want and nothing I need. I don't need to beat John Cena. Matter of fact, you can take your respect and shove it. All I need is the WWE Championship, so you, John Cena, you just aren't worth my time." Daniel Bryan comes out. "Baron Corbin, you-- oh, it is great to be in Toronto. And Baron, I don't know if you're a dumpster fire." John: "Oh no, he is, for sure." Bryan: "Or if you're the future. I don't have a crystal ball. But I can tell you, at Summerslam, because you're clearly not dressed to compete tonight, you will go one on one with the 16-time world champion, John Cena!" Tye and Jimmy start off, Uso with a side headlock, shoulder tackle, Tye with a shoulder tackle, ten-punch, Zayn in, goes for a Helluva Kick, Jey pulls Jimmy out of the way, commercial. Back on air, Jimmy misses an avalanche, Jey in, blocks a tag, back suplex, blocked, Zayn tags in Tye, Tye with a clothesline, crossbody, clothesline to Jimmy, kick to Jey, punch, clothesline, knee drop, stomps in the corner, running knee, blocked, goes for a suicide dive instead, caught with a punch, Zayn hits a suicide dive to both Usos instead, Tye with a spinebuster back in the ring for two, Jimmy hits Zayn with a superkick on the floor, Tye goes up top, Jey punches him, tags in Jimmy, Tye blocks a superplex, punches both Usos, misses Jey, goes for the Tye Breaker, Jimmy with a kick, chop block, Tequila Sunrise for the tapout. The Usos grab mics and demand to know where the New Day are. They vow to win at Summerslam. Big E comes out, the other two attack The Usos from behind. E joins the fray, Woods grabs a pair of chairs, Jey pulls Jimmy out of the ring and they retreat. Renee Young asks Randy Orton about his grudge match with Jinder tonight and about his Summerslam match with Rusev. Orton says Rusev was in the wrong place at the wrong time. Another Fashion Files Twin Peaks segment, Breeze tells The Ascension about his dream last week. They leave with pie. Fandango comes in, he's all weird, he drinks coffee, says aliens kidnapped him, he could've left any time he wanted to, but they gave him the ability to see into the future. He says the next person to come through the door was the one who killed Tully the horse. Arn Anderson walks in, they ask if he killed Tully, he says yes, because they should've named him Arn. Then he takes their donuts. Breeze says their work has just begun. On WWE.com last Tuesday, Lana said she idolizes Tamina, but wants to be more charismatic. Lana tries to shoot a leg, shoots a waist instead, Charlotte tosses her down, Lana goes for a boot, blocked, slap, blocked, another, ducked, Charlotte trips her, chops, back body drop, reversed into a sunset flip, reversed into a toss to the corner, Lana hulks up, Charlotte misses a boot, Lana with a boot, goes for a hip toss, doesn't work, goes for a backslide, Charlotte laughs her off, reverses it into a backslide for two, tells her it was that close, Lana with a slap, Charlotte with a big boot, Figure 8 for the tapout. After a commercial, Shane McMahon hits the ring. "What's up, Toronto? Thank you for that. Obviously, last week, during the United States Championship Match, it ended in controversy. Daniel Bryan, using his power as General Manager, made me the guest referee for that match. Without further ado, allow me to introduce you to the participants for that match. First, the challenger, Kevin Owens." Shane: "And his opponent, the current United States Champion, The Phenomenal AJ Styles." They trash talk off-mic while Shane holds them back. Shane: "Alright, if I may, see a 50-50 sentiment going on here. Let's see if I can clear the air, starting with you, Kevin. You had some apprehension about the match. That might be putting it mildly, you got in my face screaming that I wouldn't be a good referee." Owens: "That was the heat of the moment, I want to apologize. I don't need to worry about you, we've already had a McMahon screw over a legendary Canadian for a title before. Of course, he deserved it. But I don't, and it would quite frankly be really terrible PR if you were to do that to another Canadian, so I'm not worried. But I am worried about AJ. Hear me out, because how can you be unbiased toward someone who did that to you just a few months ago? (footage of AJ attacking Shane in the parking lot in March and putting his head through a car window)"
AJ: "You know what? I'll be the first one to admit, I wasn't happy when Daniel Bryan made you, Shane McMahon, the special guest referee. But the officiating's been crazy anyway, so good luck with that. But you, Kevin, you think we don't see what you're doing? Coming out here like some master manipulator like we don't see exactly what you're doing. But if Shane did screw me, he'd pay the consequences like he did at Wrestlemania. Don't take it personally, I don't trust anyone, especially a McMahon." Shane: "I think you have me confused with other family members, I don't do that." Owens: "Engh, but Summerslam won't be the first time you were a special guest referee, let's take a look, AJ, at what could happen to you." Owens: "Look, offensive gesture or not, that wasn't an isolated incident. AJ, search the network, you could almost make an entire collection out of this guy screwing people oer as a referee." Shane: "Are we done here? Look, Kevin, I don't like you and you don't like me, that's not a secret. AJ, we've had our battle, we went to war. But I will call this down the middle, and not get involved unless I have to. So don't give me a reason." AJ: "You know what? You weren't pinned last week. And I can't say I'm the champion until I beat you. So why don't we ditch Shane and settle this right now?" Owens: "You know what? I think I'd rather win the United States Championship in the United States, in a city that actually matters." Owens punches AJ, Shane holds him back, AJ goes for a Pele, hits Shane. Owens retreats and laughs. Backstage, Tamina walks into Lana's dressing room. Lana says she knows she's here to gloat, which she does unmercifully. She says Lana will never wrestle like her, Lana says Tamina will never be as ravishing as her. Tamina says it was Lana's ambition that got her three straight title matches, and now she's going to help Tamina get hers. Check out my Twitter to see the sign Naomi said she loved at a house show last night. Carmella with knees, face wash, Naomi with an enziguri, slap to the face, commercial. Back on air, Naomi punches her way out of a hold, body slam, reversed into a neckbreaker for two, Carmella follows up with a chinlock, Naomi escapes with a backbreaker, springboard kick in the corner, spinning back elbow, another, clothesline, volley of kicks, jaw breaker, Carmella presses her to the apron, Naomi hits a swinging kick, goes up top, Carmella crotches her, superplex, blocked, hurricanrana, blocked, elbow, grabs Naomi by the hair, ref forces a break, James Ellsworth comes through the crowd, knocks her off the top rope from the apron, Carmella hits a superkick for three. After a commercial, Carmellsworth are hanging out backstage. They bump into Nattie, who says that Ellsworth is already sticking his nose where it doesn't belong. She warns them both to stay away at Summerslam. In a sit-down interview, Renee Young talks to Shinsuke Nakamura. She asks about his debut. 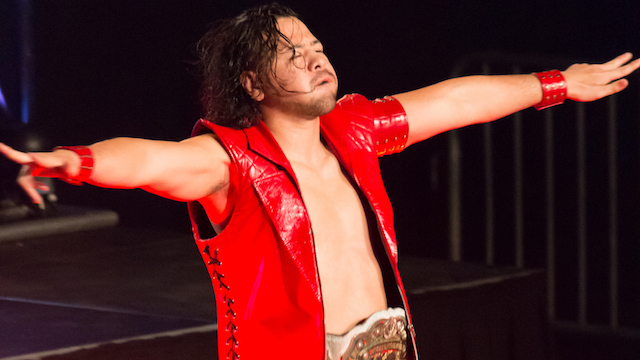 Shinsuke says he's always wanted to end up in WWE. Renee talks about his competition so far including John Cena, and Shinsuke calls Cena the measuring stick, but points out that he beat him. She asks about Jinder's match tonight, and the Summerslam match, and what it means to him. Shinsuke says it wasn't opportunity, it was destiny. Orton with boots, punches, Jinder with a punch, Orton with a boot, punches, whip, reversed, Orton with a Thesz Press, Jinder bails, Orton with a punch on the floor, toss into the barricade, toss into a different part of the barricade, back suplex across the barricade, breaks the count, hits a clothesline, back suplex into the announce table, clears the announce table, Jinder climbs back into the ring, Orton slides back in, Jinder tries to mount an offense, ends up getting hit a bunch more times and sent to the floor, Orton rolls him onto the announce table, RKO, blocked, Orton hits the barricade, lands on the other side, commercial. Back on air, Jinder hits a series of knee drops in the ropes, knee to the back, another, chinlock, Orton with punches, whip, reversed, Jinder charges, hits the ring post, drops Orton across the top rope, Orton with a pair of arm breakers to the apron, superplex for two, Jinder goes for a punch, blocked, Orton with punches, whip, clothesline, another, fallaway slam, ten-punch, Jinder drops his face onto the turnbuckle, Orton with a snap powerslam for two, stomp, kick to the face, European uppercut, whip, reversed, reversed into an Orton backbreaker, blocked, Orton with an elbow, Jinder with a knee for two, Orton tosses Jinder to the apron, hangman's DDT, calls for an RKO, Jinder with a rollup for two, uppercut, drags him up for the Kulas, reversed into an RKO for three. Well that... kind of cuts the legs out from under Jinder. Orton celebrates as Smackdown goes off the air. Until Rusev tackles him at the last second of airtime.